The Aviat aircraft factory is located on the main street of Afton, Wyoming, south of town and west of the municipal airport, to which it's connected by a lengthy taxi strip. Here Stu Horn and 60 employees turn out a trio of remarkable airplanes, each a modern version of an oldfashioned design. Two of them are aerobatic biplanes, the Pitts Special and the Christen Eagle, the latter being a kit for home-builders. The third is the Husky, which looks very much like the immortal Piper Cub, especially when it's painted yellow with a bit of black striping. In March 2003 I went out to Jackson Hole for a bit of skiing, with a side trip to Afton for the purpose of meeting Stu Horn and flying a Husky. 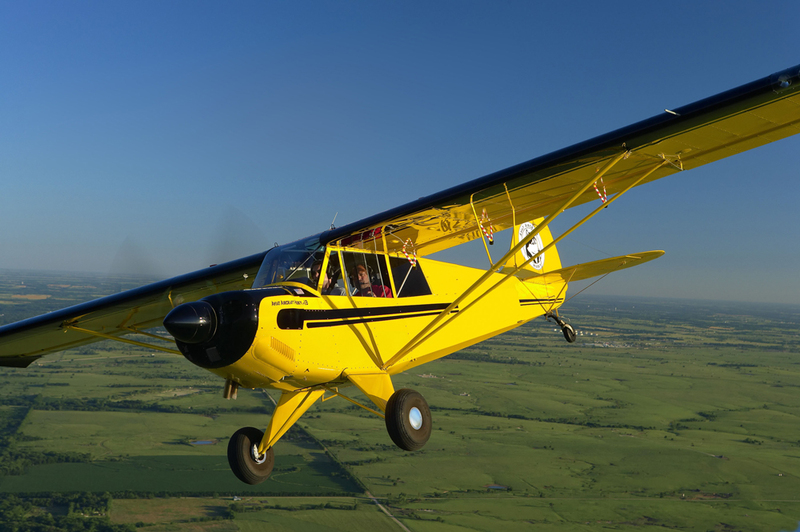 Afton municipal has a field elevation of 6,200 feet, which goes far to explain why the Husky has a 180 hp engine (compared to 65 hp for a typical J-3 Cub and 95-150 hp for the Super Cub). It also has semi-Fowler flaps, vortex generators, a constant-speed propeller, and a more modern airfoil than those on the Cubs. As a result, the Husky can jump off a high-altitude runway with as much panache as a Super Cub at sea level. I really didn't notice any altitude effect, even though the tarmac was higher than I'd ever flown in Zero Six Hotel, the doughty J-3 that I rent from Hampton airport in New Hampshire. I was especially awed that, when I was in the pattern at Afton, I was higher than the summit of Mount Washington, the tallest peak in the northeastern United States. The Husky is a bit larger and is definitely heavier than the Super Cub. Its latest iteration, the beefed-up A-1B, weighs 1,190 pounds empty, compared to 930 for the Super Cub. Some of the extra heft is in the engine; some results from a more robust frame. As Stu Horn likes to point out, the Cub was designed in the 1930s, and if William Piper were to take his J-3 or even his PA-18 to the FAA today, he wouldn't come home with a certification. One notable difference: the "bird cage" structure in the Cub is based on a longeron that more or less parallels the bottom of the fuselage, from the horizontal stabilizer to near the firewall, passing below the side windows. It's this design feature that allowed the Cub to be "chopped" as an air ambulance: immediately behind the trailing edge of the wing, fully half the fuselage depth is really just padding. In the Husky, this is all reinforcing structure. The plane is soloed from the front seat, which appears to have been raised a bit for the sake of forward visibility. This adds to the difficulty of flying from the rear seat. Not only are some of the controls missing (all you get are a throttle, joystick, rudder pedals, and toe brakes) but the instruments are pretty much concealed by the shoulders of the guy in front. In the J-3 I can see what I need by bobbing my head around, but I felt behind the curve in the Husky. Slow-flight performance is better in the earlier and somewhat lighter A-1A, which stalls at 33 mph with power and flaps, and lands at 48 mph. An Aviat spokesman attributed the differences to the 110-pound increase in gross weight and more forward center of gravity in the A-1B. The flaps, by the way, are a mechanical lever arm, much like the Super Cub. As I expected, flying from the front seat was a whole lot easier. The constant-speed prop was more formidable in prospect than in actuality. The tight fit I'd noticed in the A-1B at Afton proved to be no problem at all for a front-seat driver, especially once I got used to climbing in and out. The bungee-cord trim system and the 31-inch tundra tires also didn't live up to their advance billing: I scarcely noticed they were any different from what I'd flown elsewhere. The subtle control movements on a Piper Cub just don't get respect from the Husky: you do indeed have to be more forceful. The flaps are much more powerful than the Super Cub's. The plane is heavier; it's bigger, despite the fact that the wingspan is about the same; and it lacks the cute-as-a-bug appearance of the J-3 and even the PA-18 Cubs. Overall, I judge the Husky to be an airplane that you'd respect and even like, but one that doesn't inspire the sort of love that goes with the Piper designs. The most interesting development in the Husky line is a stripped-down model called the Pup, which got its Type Certificate in the summer of 2003. With no flaps, a 160 hp engine, and a fixed-pitched propeller, it achieves a remarkable improvement in economy without a huge loss of airborne performance. Your basic Husky sells for about $140,000 before you add those very expensive avionics; the Pup is meant to retail for $110,000 with a highly respectable instrument package, including transponder. "Essentially, we've taken the Husky back to basics and produced an aircraft that has a substantially lower price, yet it still has many of the Husky's desirable performance and design specs," said Aviat President Stu Horn. "This is an airplane for people who fly for fun and enjoy poking around in the back country. It requires a little more room than the Husky for getting off and landing, but it can be taken into all the same environments and will be adaptable to floats and skis. Pups do have STOL performance and can be flown in a really wide speed range -- 50 to 140 mph." The weight savings mean that its speed is the same or better than as the Husky's, and its fuel economy is greater. But the absence of the flaps does bring a penalty: Aviat thinks that the stall and landing speeds will be about the same as for the Husky without flaps. The takeoff and landing distances will more than double to 500 feet and 900 feet respectively. At a guess, those figures are less impressive than what I get out of Zero Six Hotel, especially for the landing roll. Let's hope Aviat will consider adding flaps to the Pup, either as standard or as an extra-cost option.